I'd like to take a moment to direct your attention to something I've been working on the past couple of weeks. After my most recent post, in which I talked briefly about homelessness, I searched through all my images just to see what came up. I was somewhat surprised to find I had over a hundred pictures for which I had keyworded "homeless" when saving them to my hard drive. Now, my background in journalism has kept me in check, forcing me to recognize that just because somebody is asleep on a park bench, that doesn't necessarily make them homeless. And how do you define "homeless" anyway? Still, in full disclosure, I sometimes cringe as I am keywording an image I want to save. 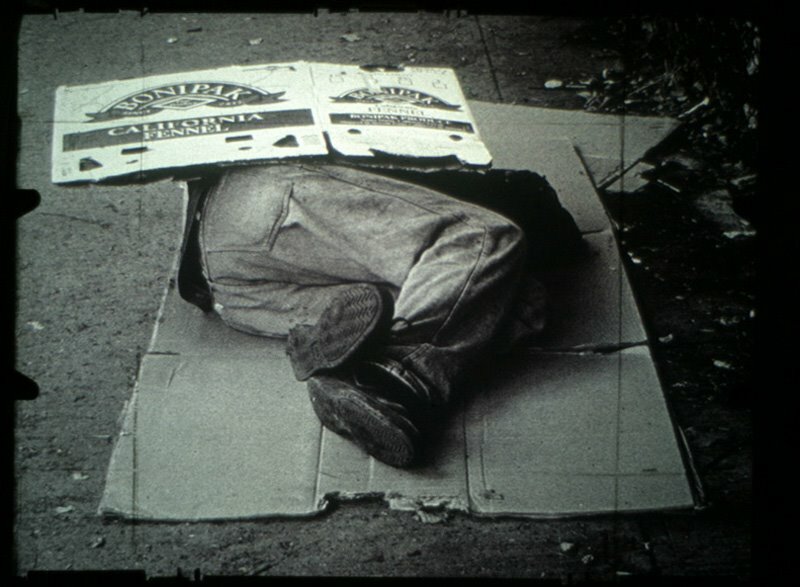 One such image a few years ago I keyworded: "homeless man asleep sara roosevelt park sleeping bum gutter". Much more common keywords for my pictures in my archive include "bar" "couple" "cellphone" "Houston" "construction" "WTC" "hipster" and "nightlife". When people ask me what kind of photography I do, I certainly don't say words like "social documentary" or "reportage" or "in-depth" or "long-term." Typically I say "Oh, just New York City imagery. Basically the crazy, quirky stuff you see walking around the streets." (I often cite this Inge Morath picture as being a quintessential NYC quirky photograph.) It's not that I don't appreciate the "Concerned Photographer," it's just that I don't view my photography as being a catalyst for changing the world's ills. That being said, and this being the week of Thanksgiving, I'm going to take a stab at generating some awareness toward our fellow New Yorkers who aren't as fortunate as most of us. Taking one picture of one homeless person doesn't seem like much. But when viewed as a group of images, as a theme I find myself revisiting, as a "body of work" if you will, I think it starts to make a bit of a statement. Click here to view what I am talking about, a short movie I put together using my pictures of the homeless. And when you're done, I would urge you to take a look at the Coalition for the Homeless website (and donate if you are able to) and educate yourself on the principles of harm reduction. At the very least, please try and dig a little deeper into your pockets next time you encounter somebody asking for a little help.